Painter, draughtsman, illustrator, Charles de Belle was born in Budapest in 1873. As a boy he drew and painted with the encouragement of his uncle. On his 16th birthday he went to Paris where he studied with Mihàly Munkàcsy in Paris from 1889 to 1892. He won several scholarships and later, an annual grant from the Royal Academy in London, which enabled him to travel and study in Europe at Antwerp (1885 onwards); Paris (1889 onwards); London, England (1883). In Ireland he was an illustrator for the Dublin Timesand he also married an Irish girl. He later returned to England. He lived in London from 1893 to 1912 where he contributed with illustrations to the Illustrated London News, the Lady’s Pictorial and for Blackie & Son, William Collins Sons & Co.
De Belle arrived in Montreal in 1912 with his wife and children. He presented his canvas “In Flanders Fields” to McGill University in memory of Dr. McCrae author of the poem “In Flanders Field” and who was a member of the McGill faculty of medicine. He was a member of the Associate of the Royal Canadian Academy of Arts. He died in Montreal in 1939.De Belle became a painter of portraits, landscapes, and children. He did some exceptional winter scenes. In his paintings de Belle developed his own method of fixative for his pastel work and mounted his pictures between two pieces of glass. He started working in oils about 1904. 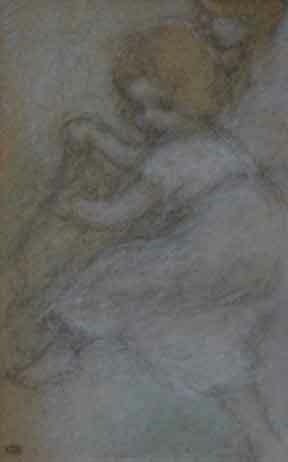 He shift to oils when ill health deprived him of the rigid control of his hands, so necessary in pastel works. He held two large exhibitions in Montreal in 1923 and 1925. He also exhibited at the Johnson Art Galleries Limited, Montreal, and the T. Eaton Co. Toronto, 1934. His work is in private collections in U.S.A., England, Scotland, Ireland, Europe, and in Canada at the National Gallery of Canada, the Art Gallery of Ontario; Montreal Museum of Fine Arts, and the Provincial Parliament Buildings, Quebec; Residence of Lieutenant-Governor of Quebec. Source : Catalogue of the national gallery of Canada, Canadian art, volume one,Ottawa, 1988, p. 74 and Colin S. MacDonald, A dictionary of Canadian artists, Volume 1, A-F, Canadian Paperbacks, Ottawa, 1977, p. 170-171. This entry was posted in Biographies, De Belle Charles and tagged Charles de Belle, pastel by chocolat. Bookmark the permalink.